Hey, all. Welcome to a post that’s a bit of a hybrid, like a cronut. 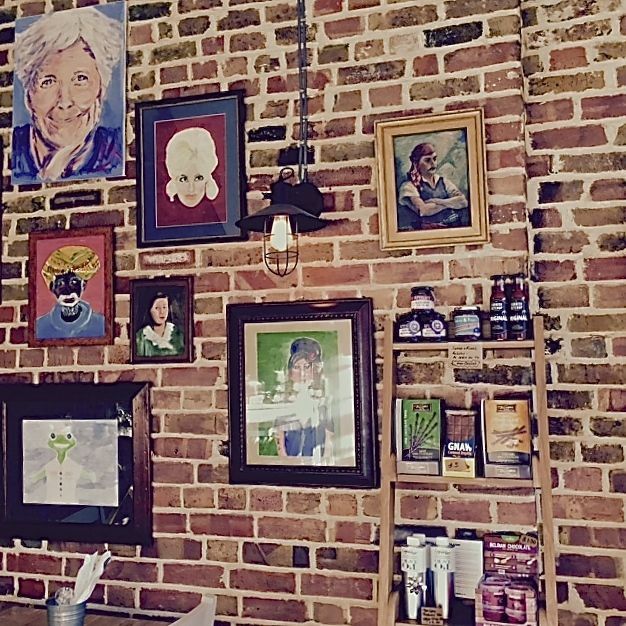 It’s both a coffee shop review and the tale of the secret screen prints. Sorted? 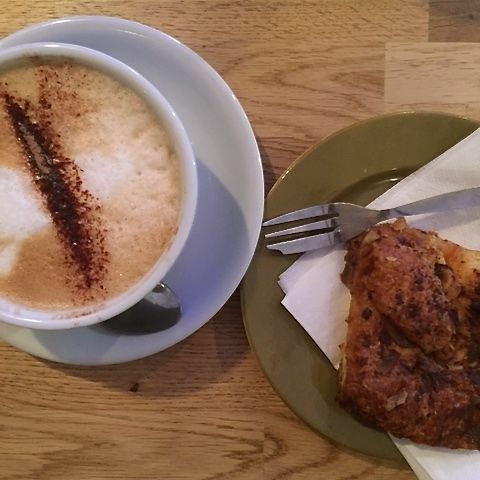 Right let’s get started… I love nothing more than a piece of cake and a skinny cappuccino in a takeaway cup with a straw. However, working from home while simultaneously entertaining/making sure my 16-month old doesn’t stick her fingers in plug sockets does not afford much time for cake-baking. And coffee at home is never the same. 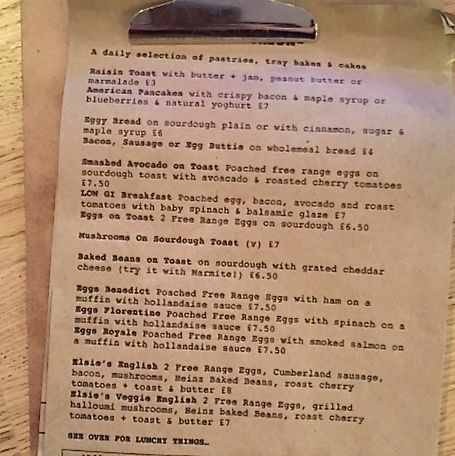 Not only does Elsie do coffee and cakes, it does pastries, savoury muffins, chocolate croissant bread pudding slices (top left), breakfasts, sandwiches, soups, sharing platters and big steaming bowls of chilli. And booze. 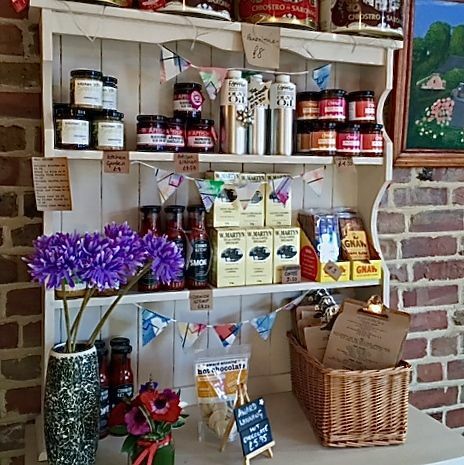 Because it’s a deli, it also does takeaway organic loaves, posh chocolate, panettone in glamorous boxes, quirky handmade cookies and chunky chutneys with amusing names. 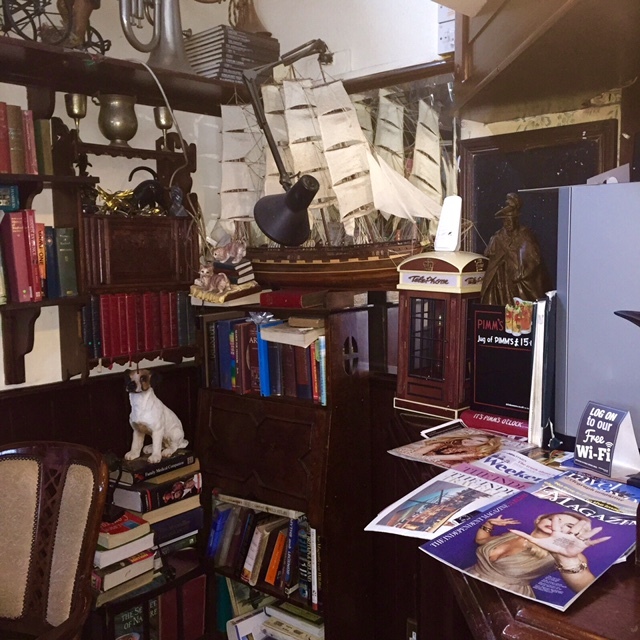 Owner Claire has also adorned the place with her own quirky artwork, bedecked it in fairy lights and fills the airwaves with a cockle-warming mix of crackly jazz, show tunes, Bowie and James Taylor. The result is a twinkly, relaxing little haven. 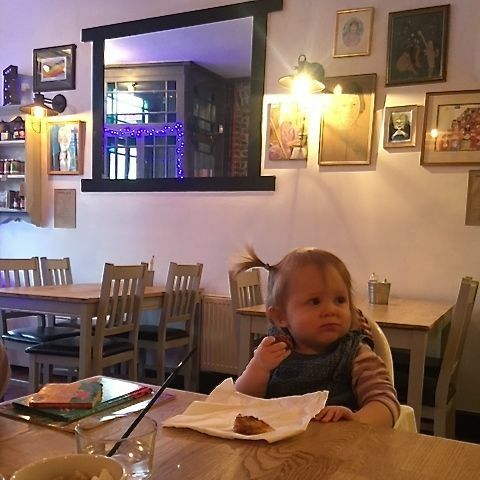 You can eat here, drink here, work here – and take your toddler without causing too much chaos. 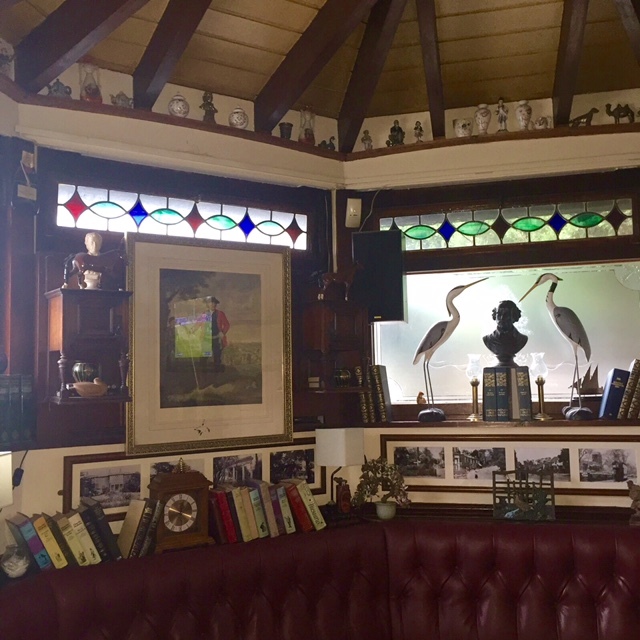 There’s a mini library for you to help yourself to books, a menu of nighttime events coming up – Time Traveller’s Wife author Audrey Niffenegger is hosting an evening at the end of March – and a primary-coloured portrait of Jeremy Corbyn in one corner. He’s promised to visit the place soon. He wouldn’t need to do up his top button here. Anything goes. Baby J and I practically live here. Anyway, one day Claire produced a bulging Ikea bag of fabric from behind the counter and asked if we could do anything creative with it. She explained that it had come from the daughter of a local lady named Irene Kent Gouly, who had sadly recently passed away and left behind a secret stash of gorgeous handmade screen-printed fabrics. Apparently, screen-printing was Irene’s not-shouted-about hobby rather than her profession – but judging by the sheer volume and array of beautiful, bonkers and brilliant designs she’d left behind, she could have opened her own shop or gallery. 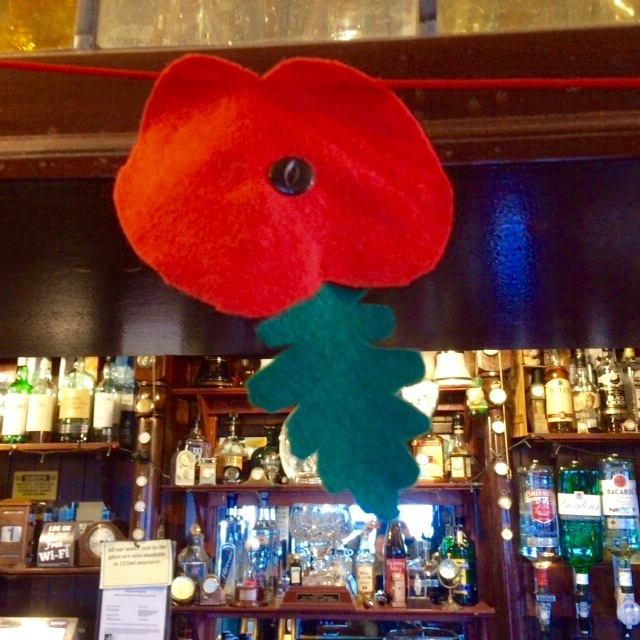 The upshot of all this was that we’d thank Claire, and Irene’s daughter, back for their generosity and beauteous threads by making something decorative for the cafe. Having Irene’s work on display in a public space, in the area in which she’d always lived, felt a fitting tribute to her secret talents. 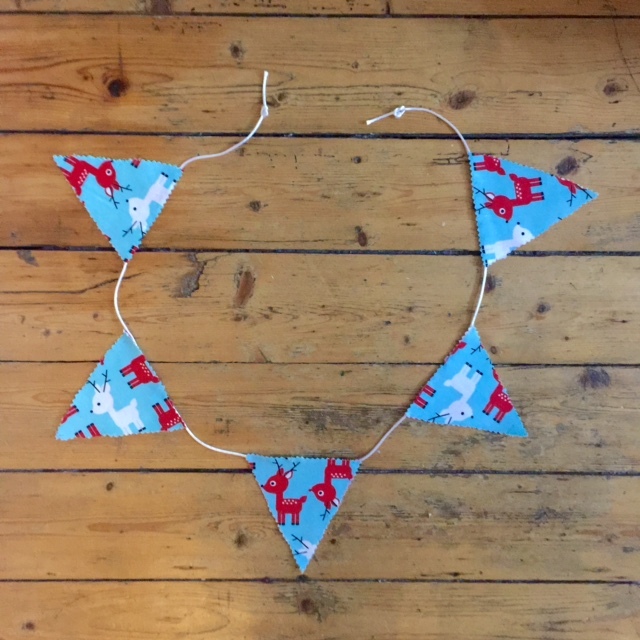 My mum suggested bunting and Claire decreed it so. 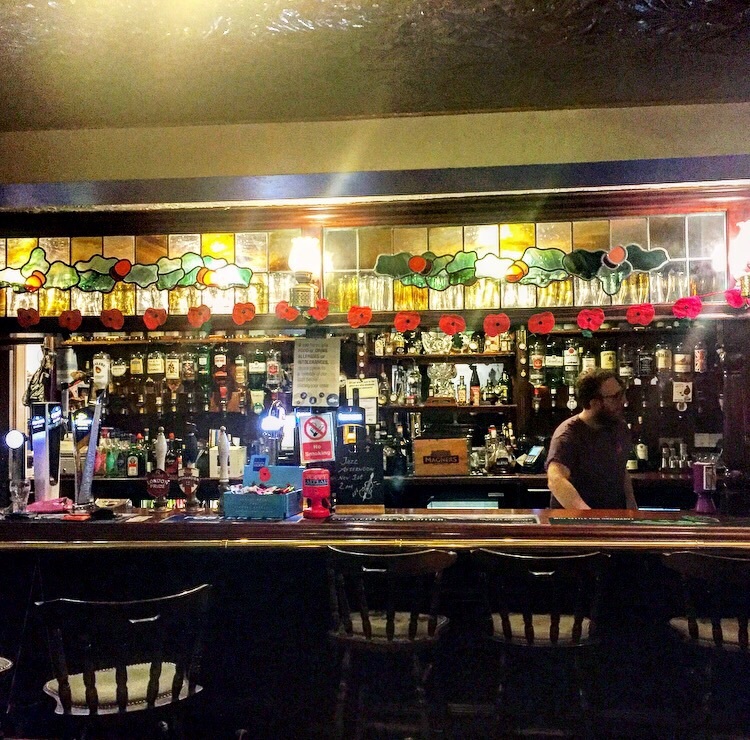 “Bunting is just what this place is missing,” she said. And so, we decided on a huge swathe of abstract print fabric, splashed in neons, pastels and black brushstrokes. It was kind of 80s but kind of 2016-ies too. 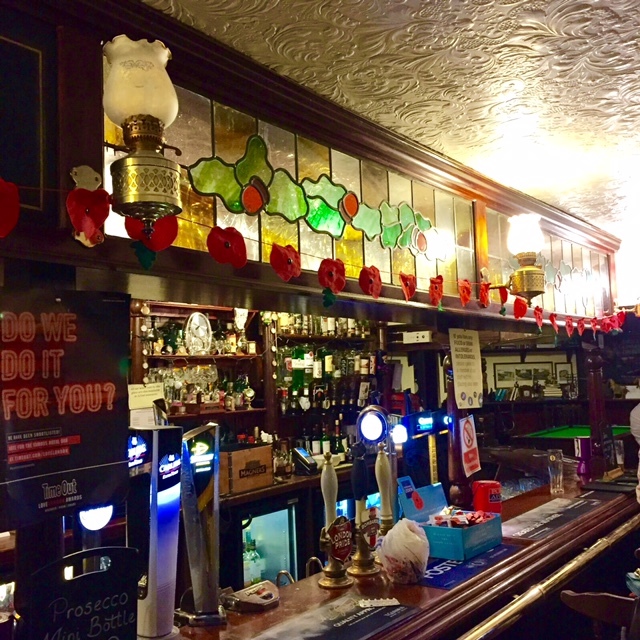 We figured it’d take the bunting from twee to edgy (c’mon, bunting can be edgy) and that all the random colours and patterns would give each flag its own unique look. 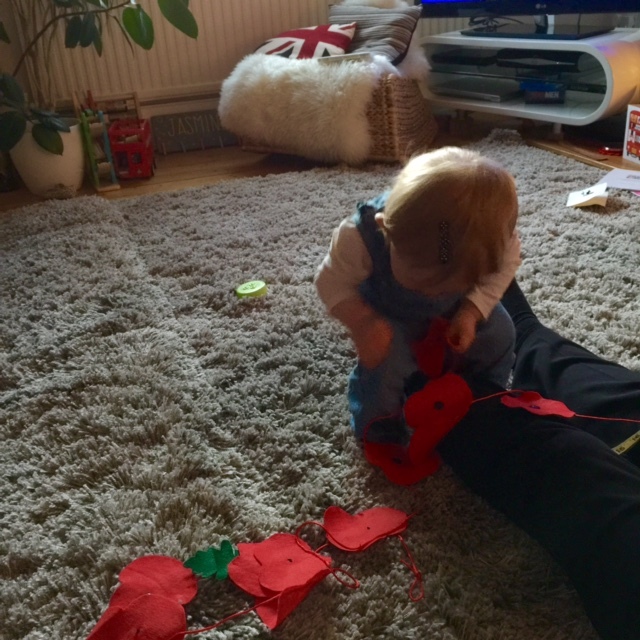 After knocking up a long piece to festoon the length of the bar, Maria – being the unashamed bunting-basher that she is – whipped up some mini flags for Elsie’s dressers, too. All that was left to do was get it in place. And happily, Claire seemed chuffed with the results. 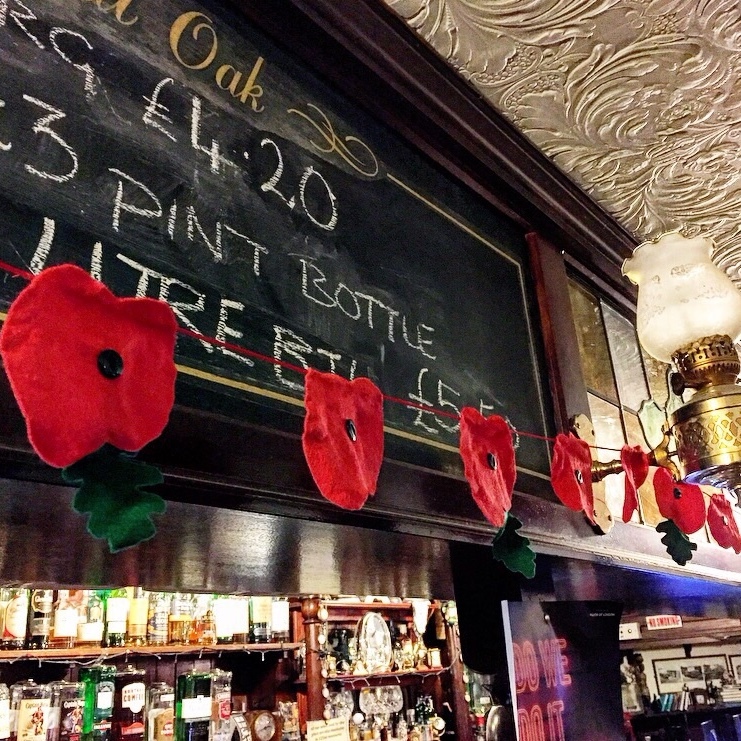 We must admit, this funky bunting does look right at home in this little joint. It was like it was meant to be. Take a look and see. 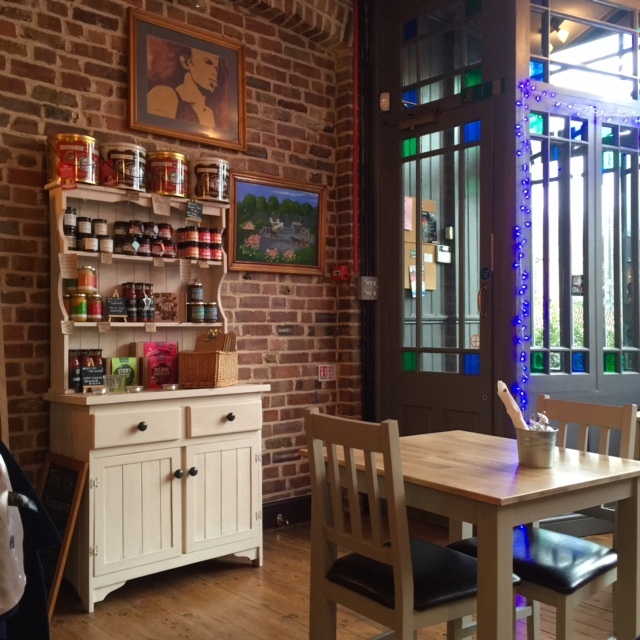 And if you ever find yourself in this part of north London, treat yourself with a stop-off at Elsie. A big thank you to the ridiculously talented Irene and her generous daughter for the inspiration. 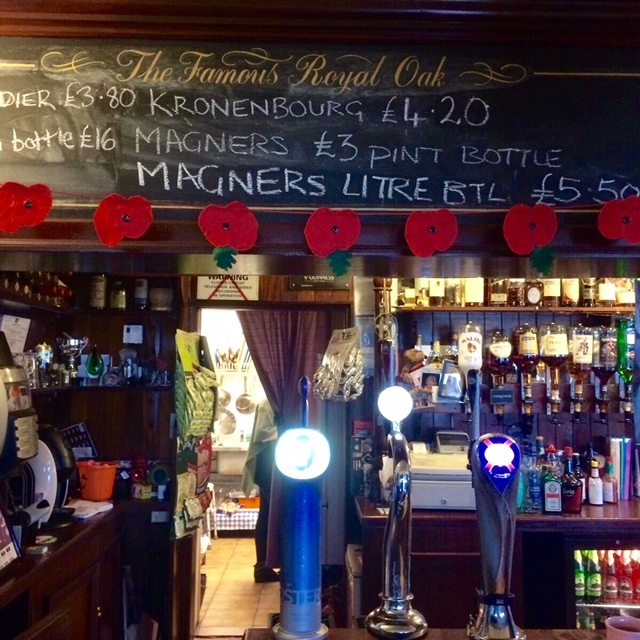 We think there might be more where this came from. Hello, loves! January is over at last. Woo hoo. 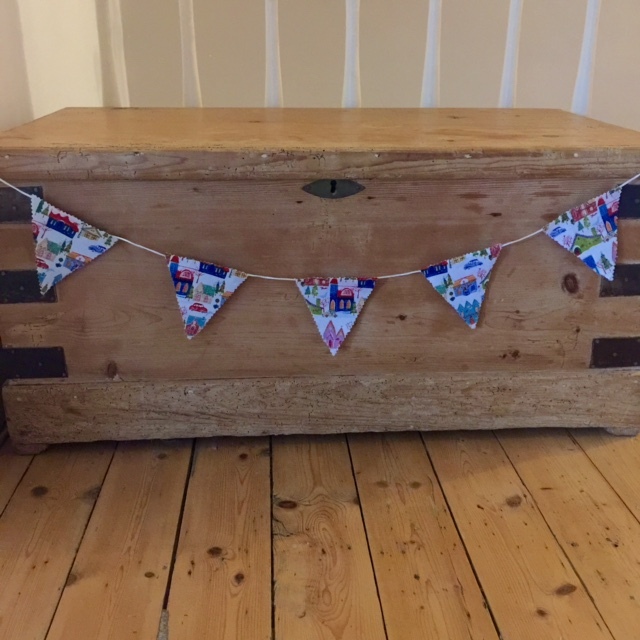 During that gloomy month, we did as much eating, Netflix-watching and crafting as we could to lift the gloom: From more bunting-for-local-businesses projects (news of which is coming to the blog, soon), to bespoke commissions and new products for our li’l shop. One of which is Doughnut the Cat, above. 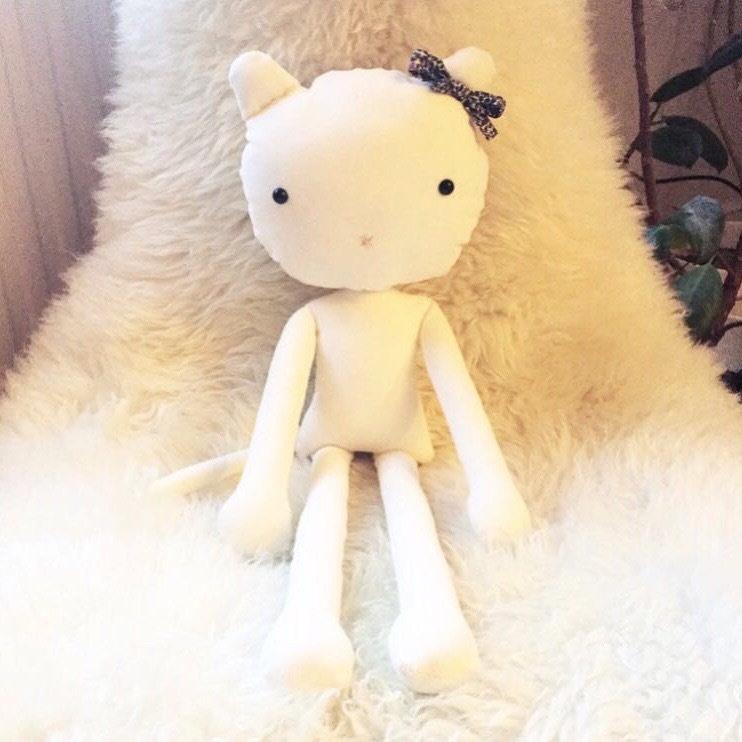 She’s a leggy, 21-inch long cordroy cat (which I made for niece Jasmine for Christmas). She’s now also in our Etsy shop and comes in cool white cord, with or without bow. We’re also taking bespoke fabric orders. So if you fancy a Doughnut made from your baby’s first babygro, for example, your wish is our command! 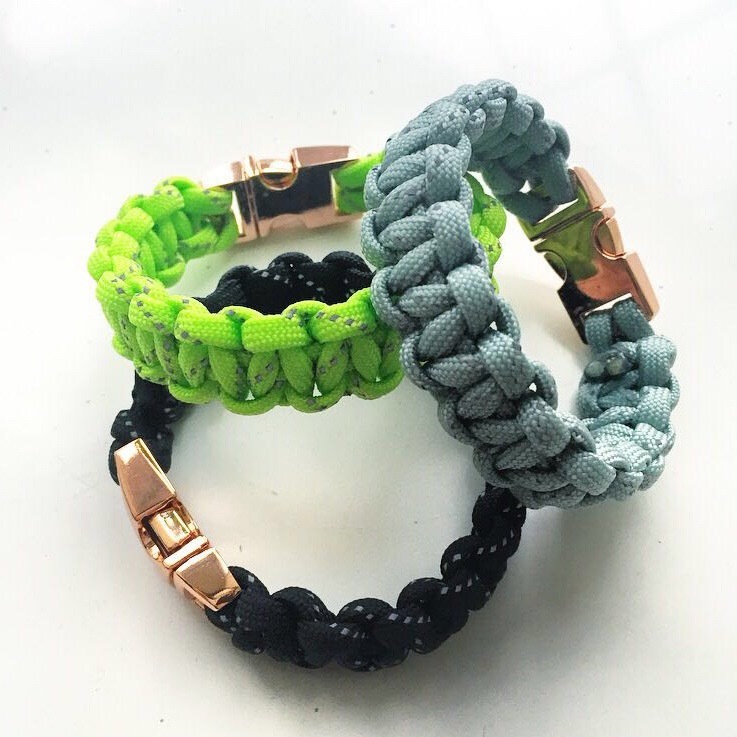 We’ll also be adding these chunky paracord bracelets with gold clasps that I’ve been working on, below. They’re a luxe take on the sporty jewellery trend and they look nice on their own or stacked up. With a casual tee or a little black outfit. What else? 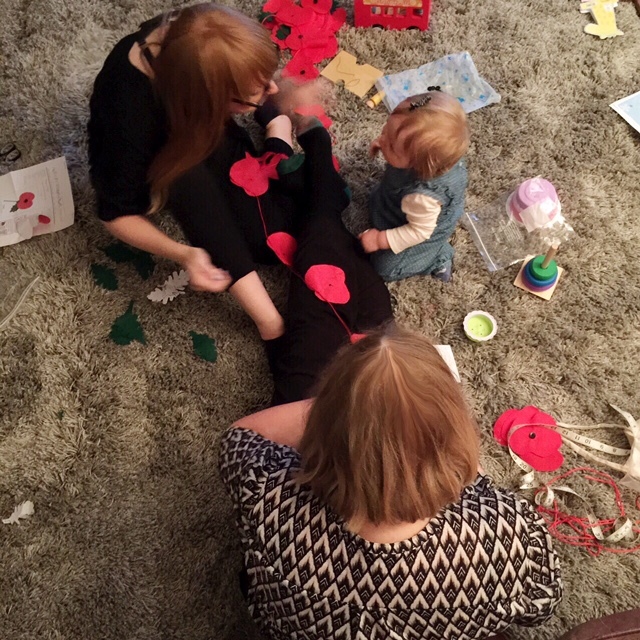 Well, Maria’s been busy bunting-ing and macrame planter-ing and Sarah’s in New York with a toddler. 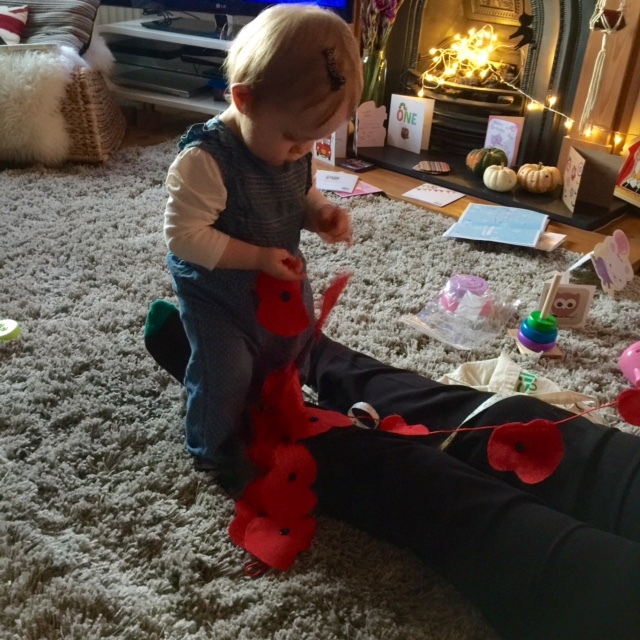 Look out for the planter how-to and ‘how to do the Big Apple with a baby’ blog posts soon! 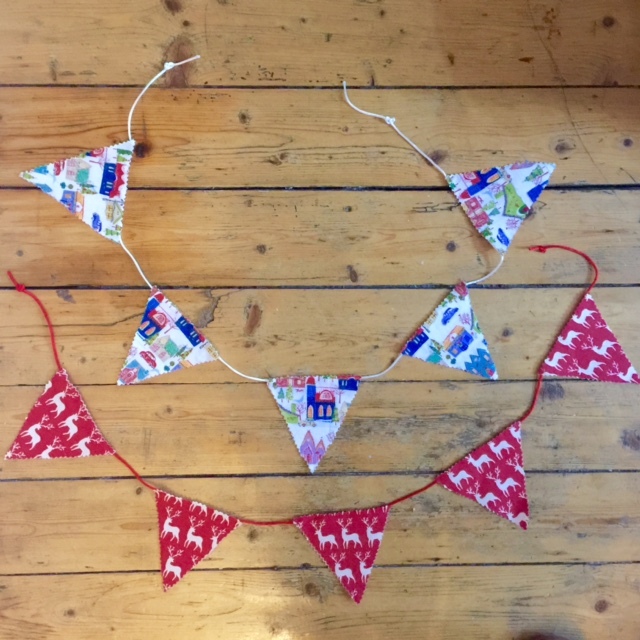 As you might have guessed, we love a bit of bunting here at We May Be Little. And the past week has mostly been spent working on said hangy stuff in all its various guises. 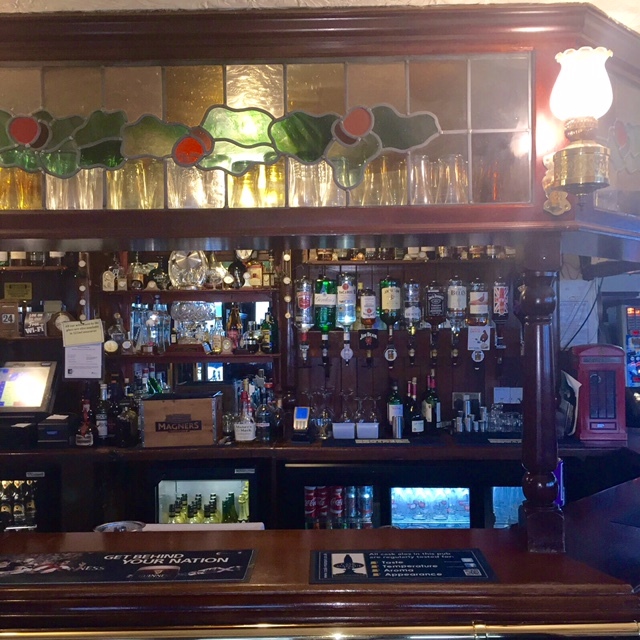 One of our projects is a bespoke commission from a local pub, which we’re quite excited about and which we’ll update you on, on here soon. 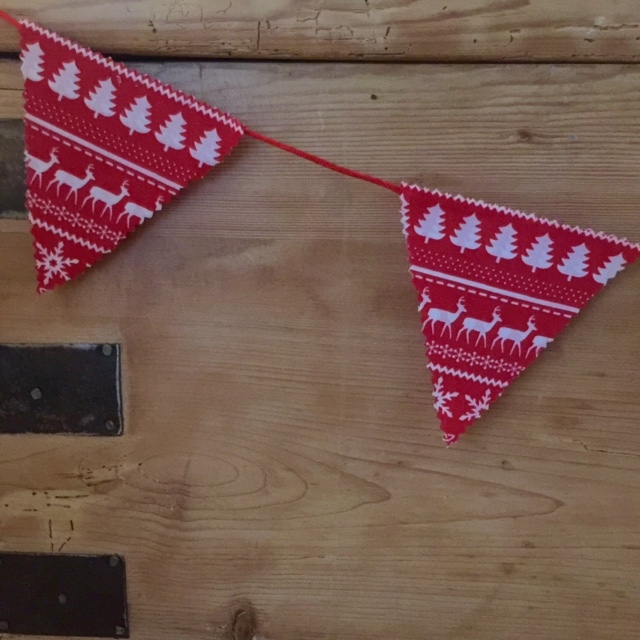 The second lot of bunting we’ve been beavering away at is of the Christmas and baby name variety, which is now in our Etsy shop. So we wanted to introduce you and let you know they come handmade with TLC and a nice price tag. After all, as soon as this weekend’s Halloween celebrations are up we’re practically staring down the gob of Christmas. 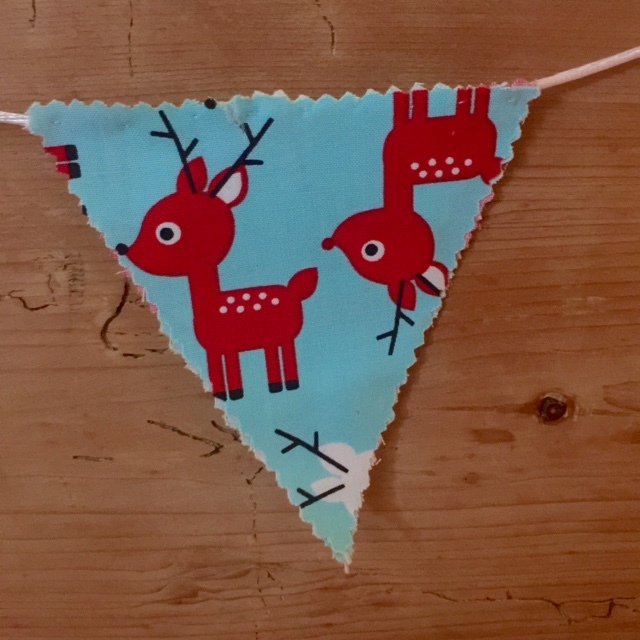 CHRISTMAS STAG BUNTING, £5 for a metre/ 5 flags – as pictured. 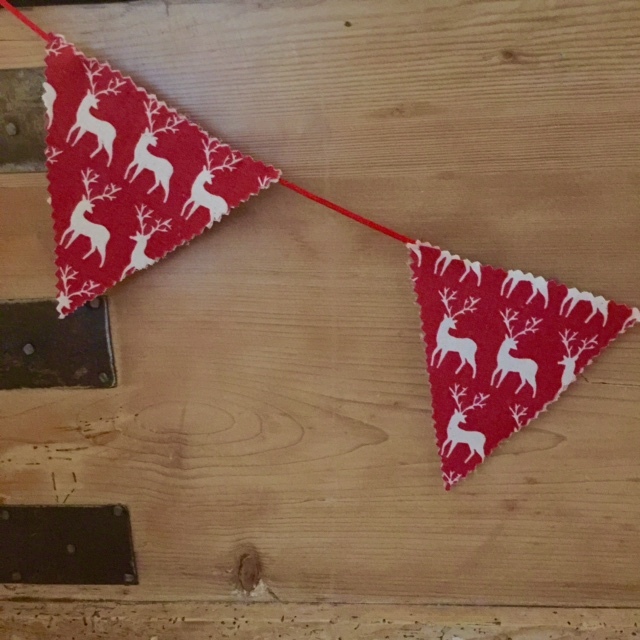 This is our standard bunting size and the perfect length for mantlepieces, shelves and chests (not those kind). 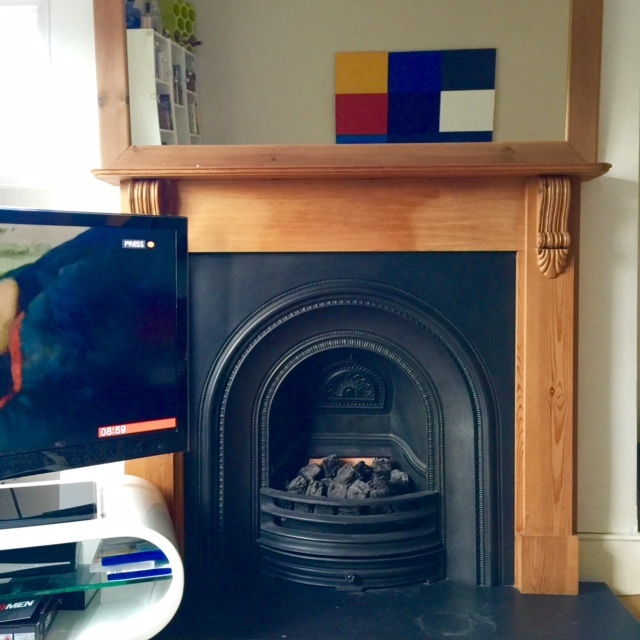 We can make longer pieces for walls if you fancy it – just send us an email and put in your requests. 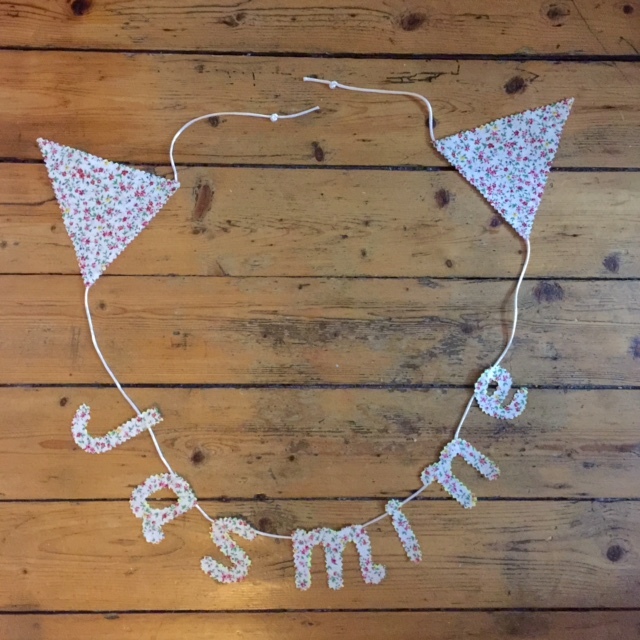 We’ve also been going for it on the baby name bunting. Lucky Jasmine (my baby girl) can’t move for the stuff. Here’s how the name bunting works. It’s a tenner for up to five letters – an extra £1 for each letter after that (so Jasmine would have cost £12 if we hand’t have made it ourselves. Though from a business point of view, maybe we should pay ourselves?) 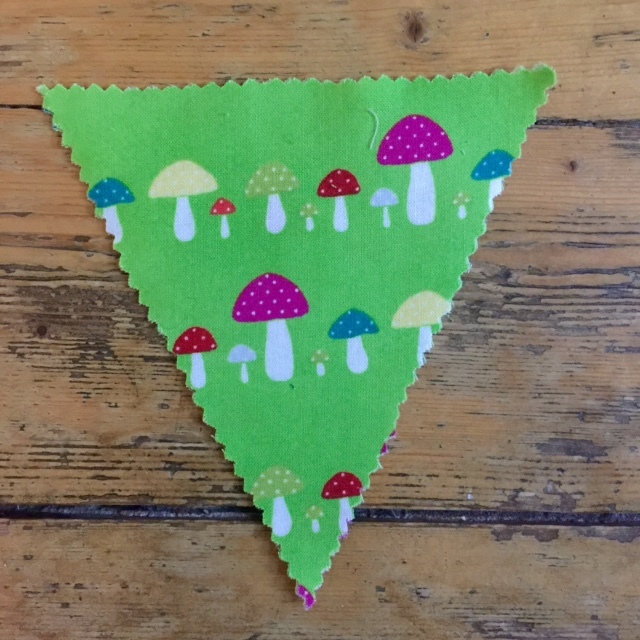 There are four different fabrics to choose from too, with more on their way: toadstools; owls; friends and flowers – see below. And there we have it. 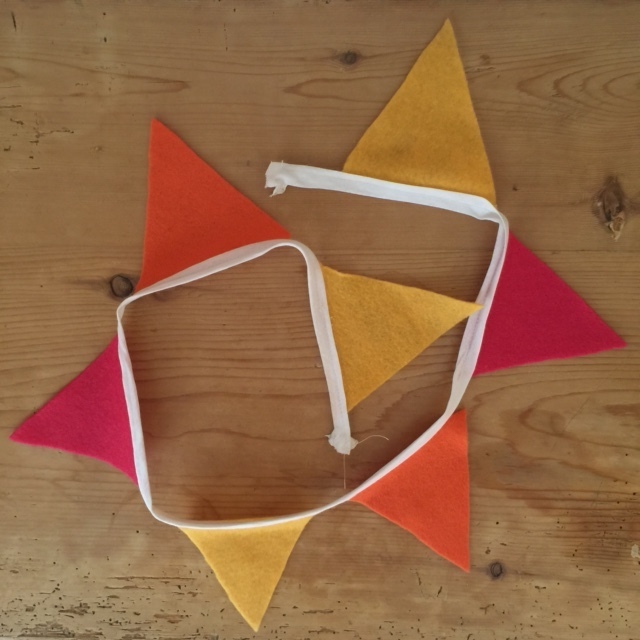 Remember, you could have a go at making your own bunting by following our mini bunting how-to. Or if you can’t be bovved with all that then we’ll make it for you. 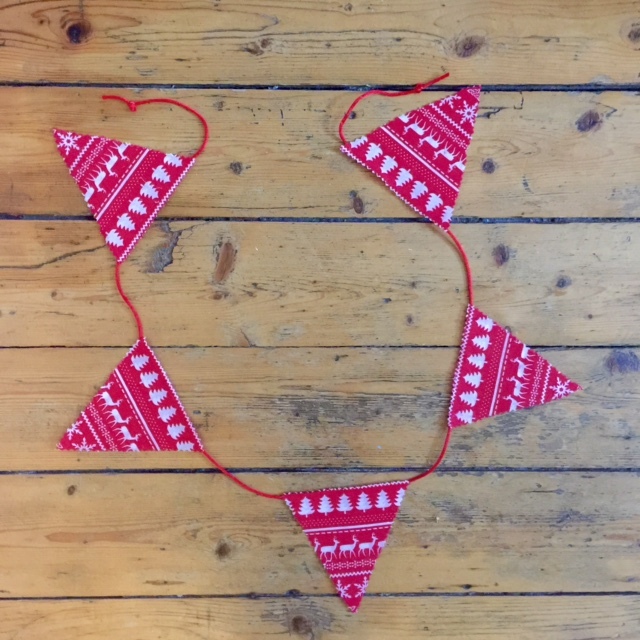 All of the bunting options above are clickable and go straight through to our Etsy shop. Otherwise you can click here. 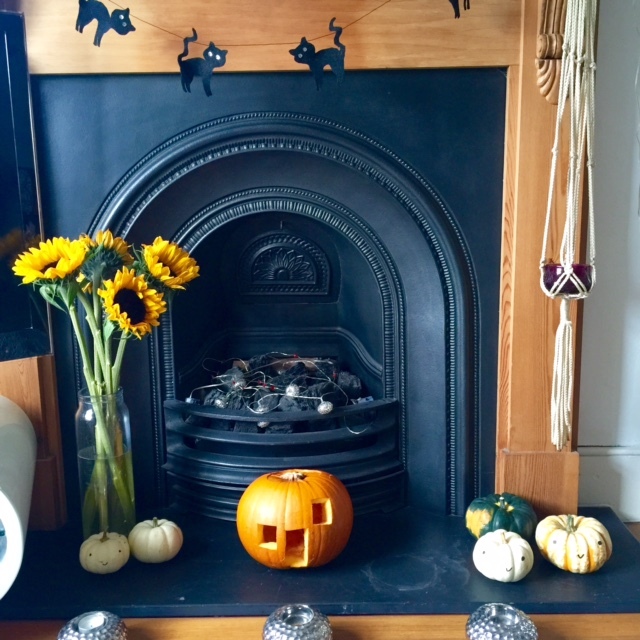 With just a week to go until All Hallow’s Eve we’ve whipped out our pumpkins and Halloween’d up our hearth. If, like us, you’re that way inclined (perhaps you too had your spooky button pushed by Scooby Doo as a nipper), then there’s no time to lose. Make a corner of your home look a little haunted with our 10-step how-to today. Or cover it from head to toe in fake cobwebs from Sainsbury’s if you’d rather. Either or. 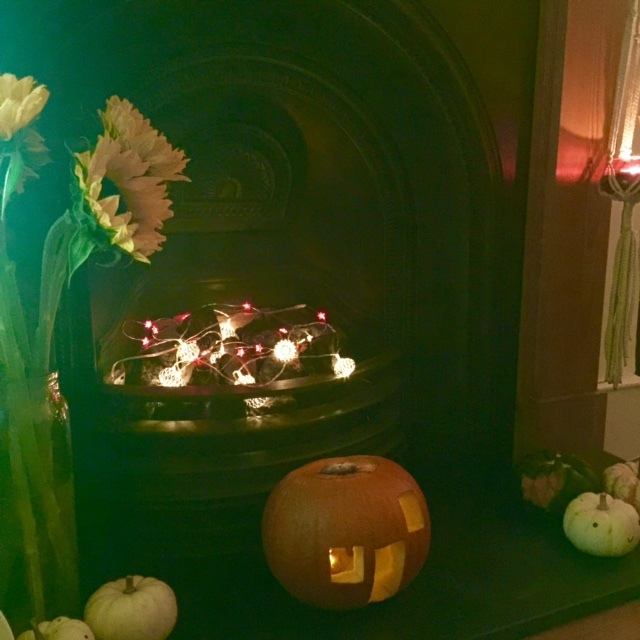 This how we Halloweened up the WMBL hearth. It’s understated but does the trick. Plus, it works on hearths and shelves alike. 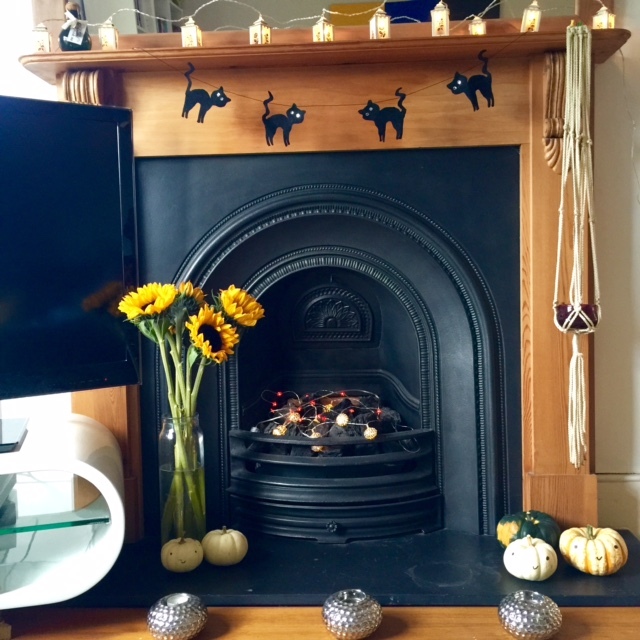 So if the fancy takes you but you don’t have a fireplace, you can simply Halloween up a spare shelf or cabinet. 2. 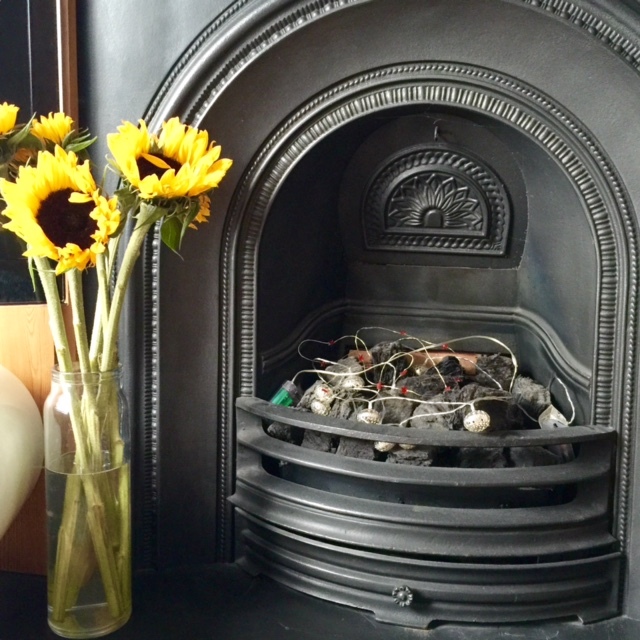 Add fairy lights to your mantelpiece first, like you do with the Christmas tree. If you don’t have a working fire, add strings of LED lights to your grate to give the illusion of flickering flames. 3. 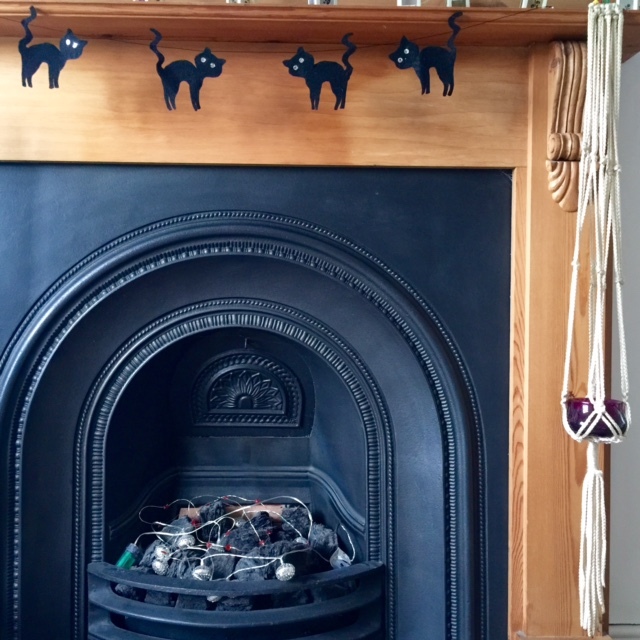 Now for some cat bunting. 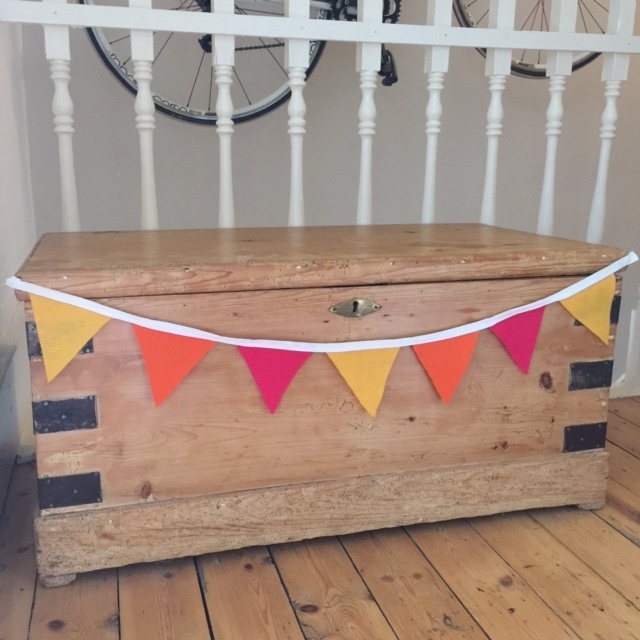 Based on the same principles as our mini bunting, this one. We May Be Little’s Maria drew a 4 by 4-inch wiggly cat, based on templates she’d seen on the net and in her own imagination. 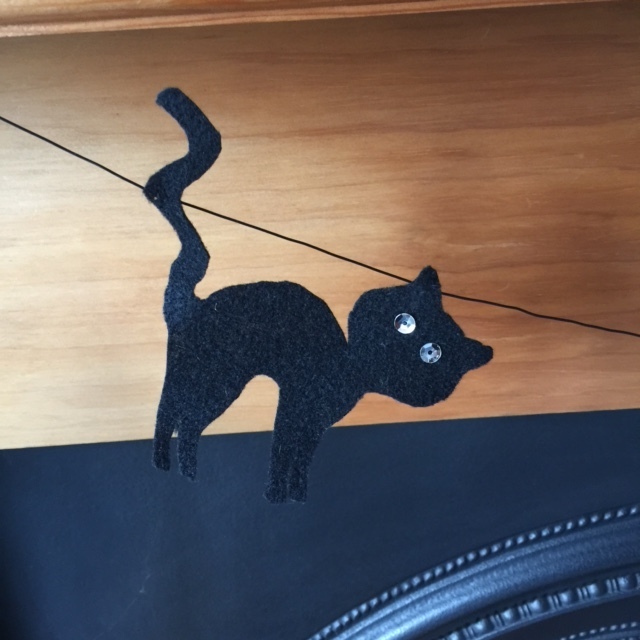 She pinned the template onto black felt and cut around it. She did 4x cats, as you can see. She glued two little silver sequins on as eyes. She then used thin black cord and threaded ’em on with a needle by their ear and tail. 4. Now for some sunflowers. That perennial autumn fave. I’m always in two minds about buying these blighters as I feel sad that they’ll never turn to the sun in a big airy field again. But, it’s autumn and we made an exception. These are displayed in a glass pasta jar. 5. 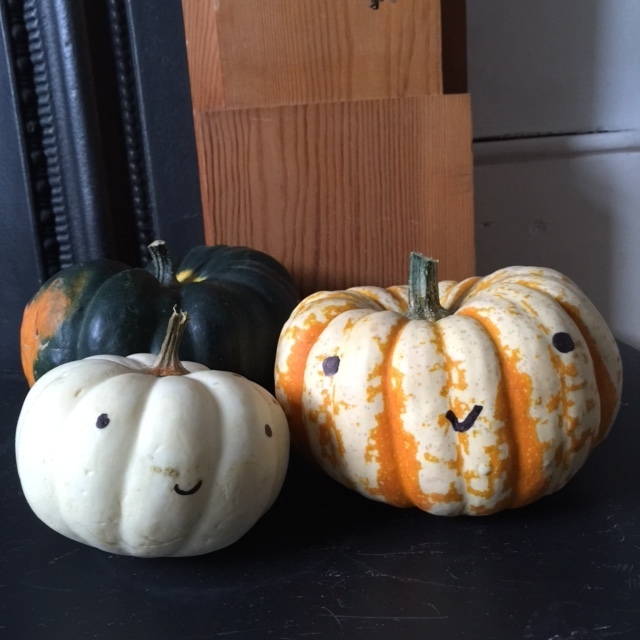 Now for the friendly mini pumpkin family to come out. The easiest how-to ever is here. 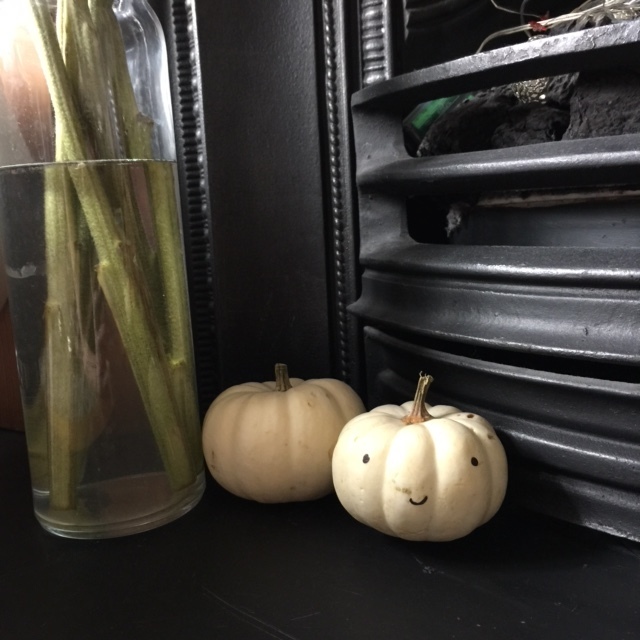 Position so your pumpkins look a little nonchalant and cool. 6. 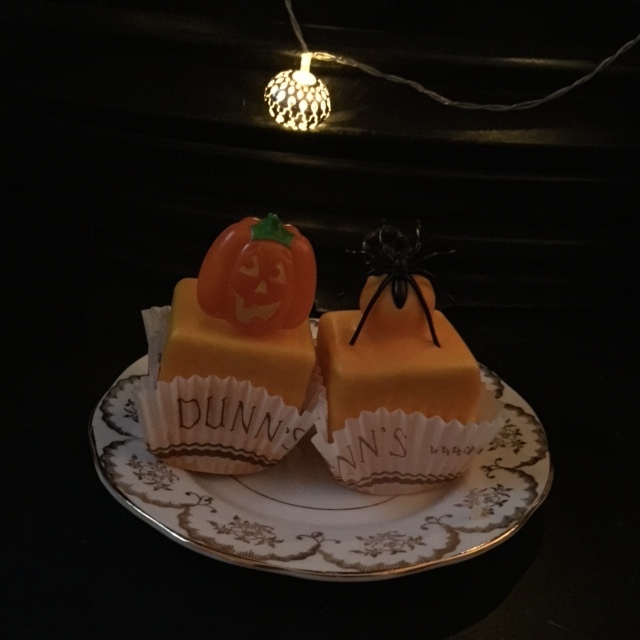 Don’t forget the Scooby snacks (cupcakes, courtesy of the fabulous Dunns Bakery in Crouch End). 7. Now for a little macrame planter action. 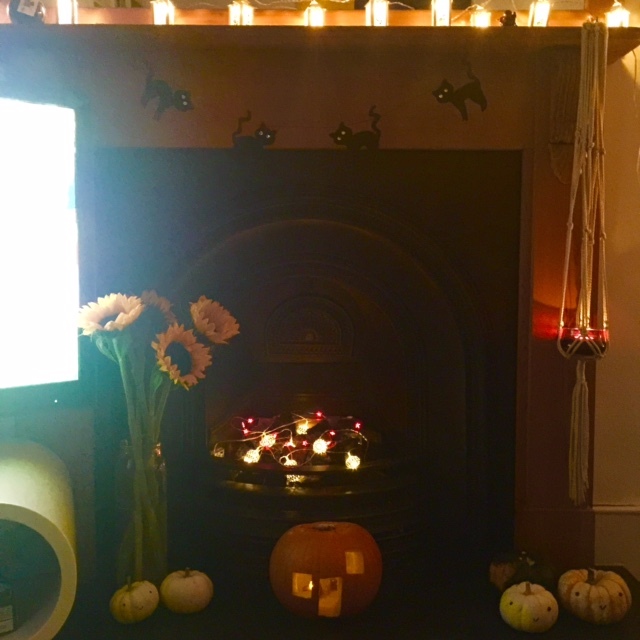 But instead of a plant, we’ve popped in a candle holder. The planter is a We May Be Little creation and will be in our shop soon. 7. 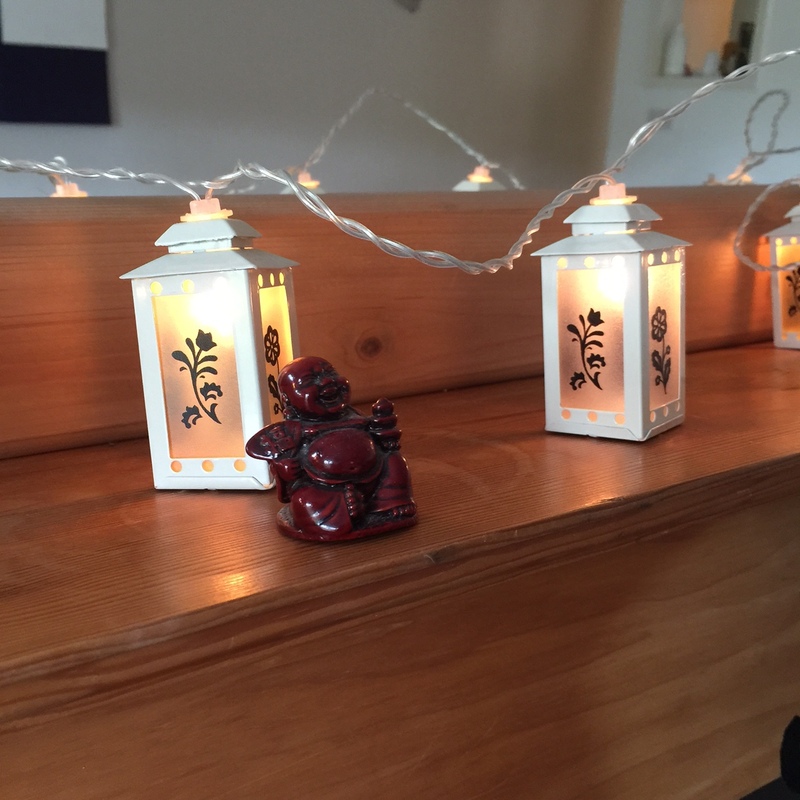 Add more candle holders and more tea lights. 8. Free-carve a pumpkin. As you can see, the wonky house creation above ain’t going to win no carving competitions. However, low-key and understated is the name of the game here. And look how winning it looks with the addition of LED tea lights and the lights off. 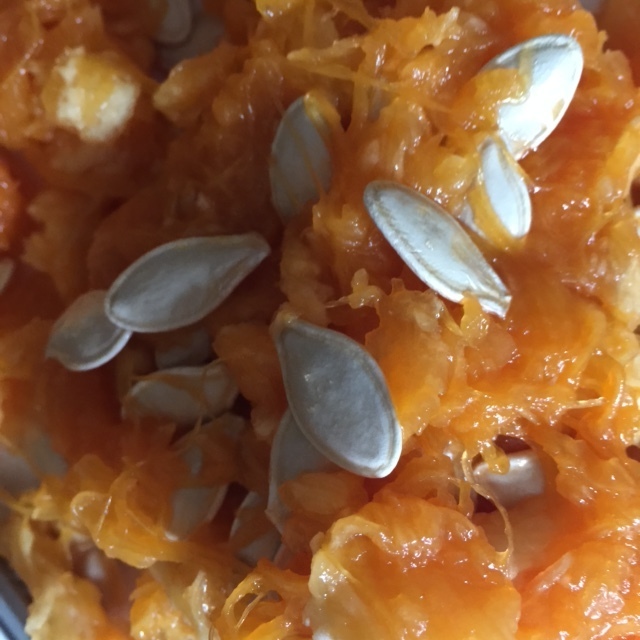 Plus, there’s something really satisfying about scooping out the seeds and pumpkin pulp with your bare hands. 9. Wait for night time to fall. Light your candles, switch on your lights. Go “Ahhhh”. Or “Aaargh”. 10. Watch something scary. Twin Peaks box set is our recommendation. And there you have it. Something to make you feel a little cosy yet bone-chilled on these dark and nippy nights. Bunting, like wine, makes things better. Just look at that storage chest above and tell us it doesn’t. 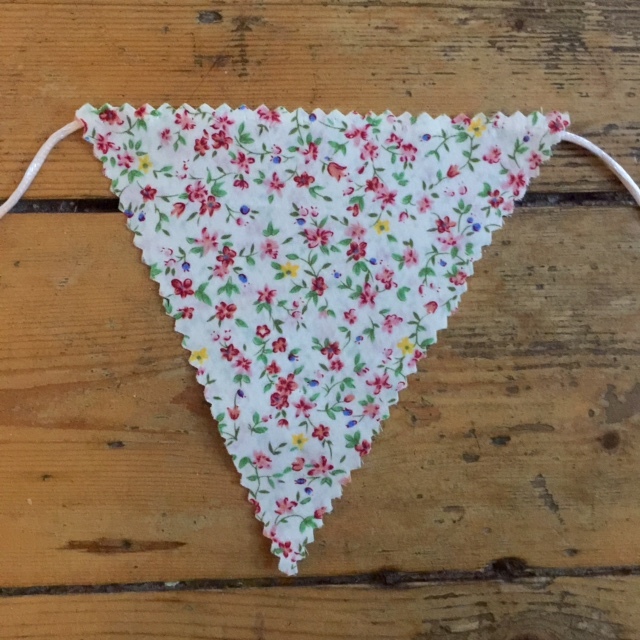 And as you can see, mini bunting needn’t be Cath Kidston-twee. For example, you could make this with dastardly skull and cross bones-patterned felt if the fancy so took you. And you can hang it anywhere. On your trunk, a la us. On your kid’s bedroom door. On a gallery wall. On a drinks trolley. 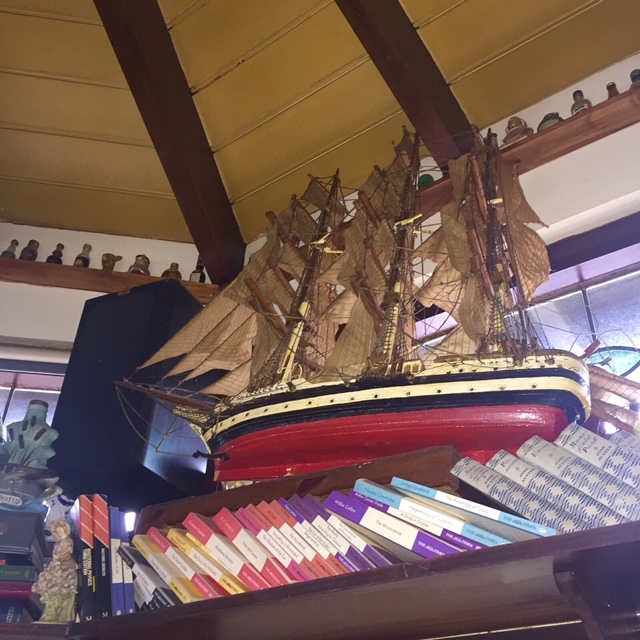 From the mantlepiece. A kitchen book shelf. Above your bed. Diagonally above your desk like a hipster blogger. Up to you. 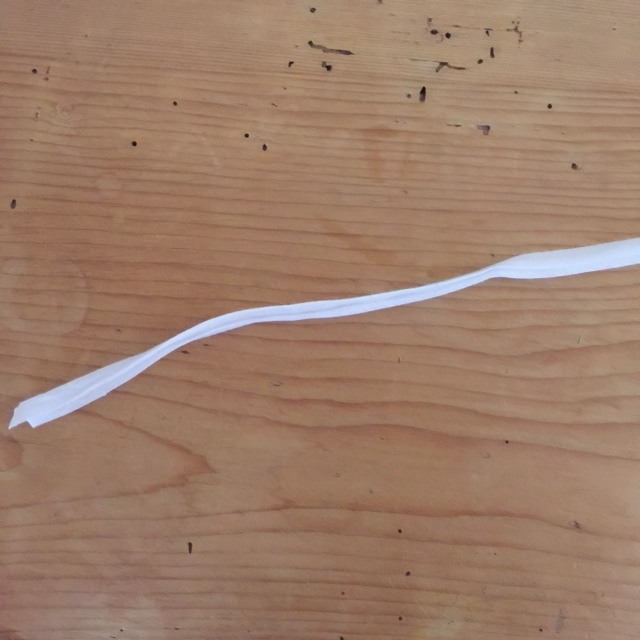 The best thing is: it’s SUPER easy to make. 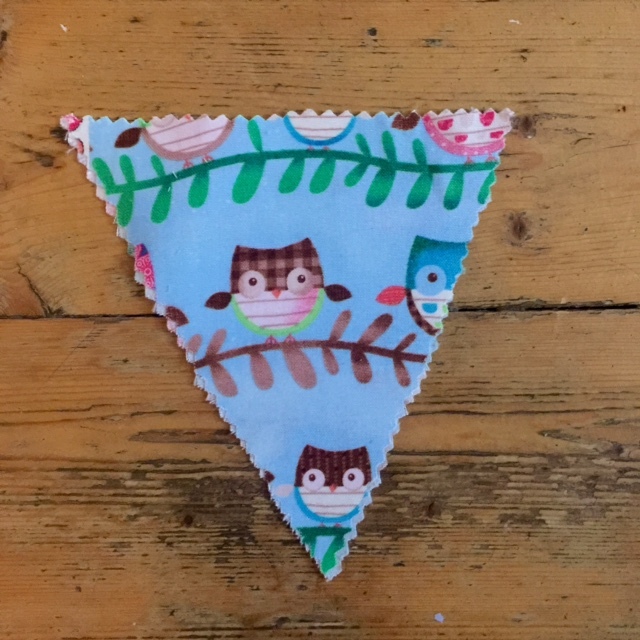 So if you’re on the market for a bit of quick and easy mini bunting making, check out this how-to. 1. 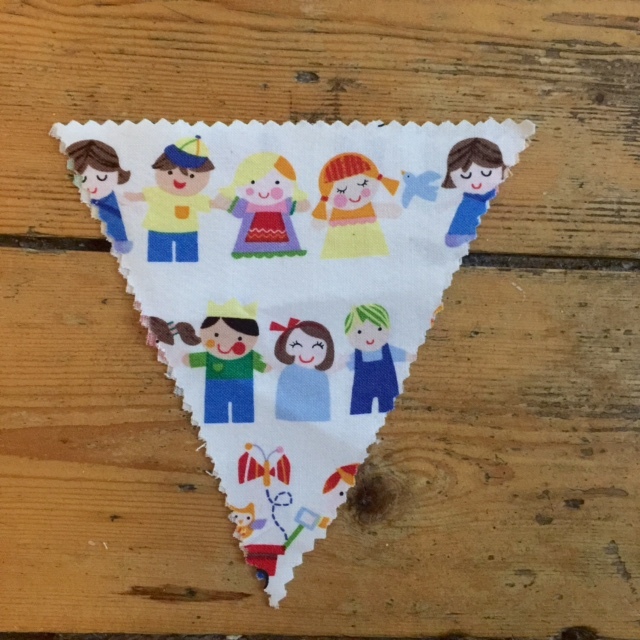 For a strip of mini bunting like this, you will need: about a meter of bias binding and your own selection of squares of coloured felt – buy from any good online or in store haberdashery. Or just Amazon it, if you must. 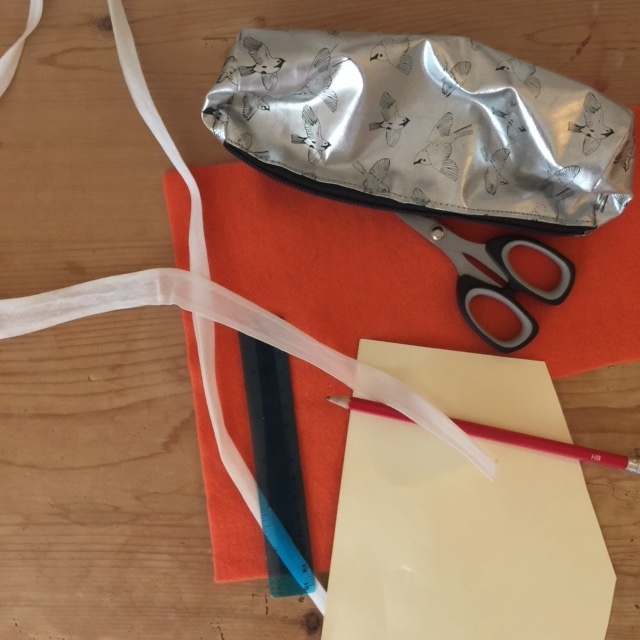 Plus, scissors (fabric ones, ideally), thin cardboard, pencil, ruler, needle, pins and thread. Oh, and an iron. 2. Make a triangle template. Using your ruler, draw a 4-inch horizontal line. Measure 2 inches in and then draw a 4-inch vertical line. Then fill in your triangle sides. Easy, right. 3. 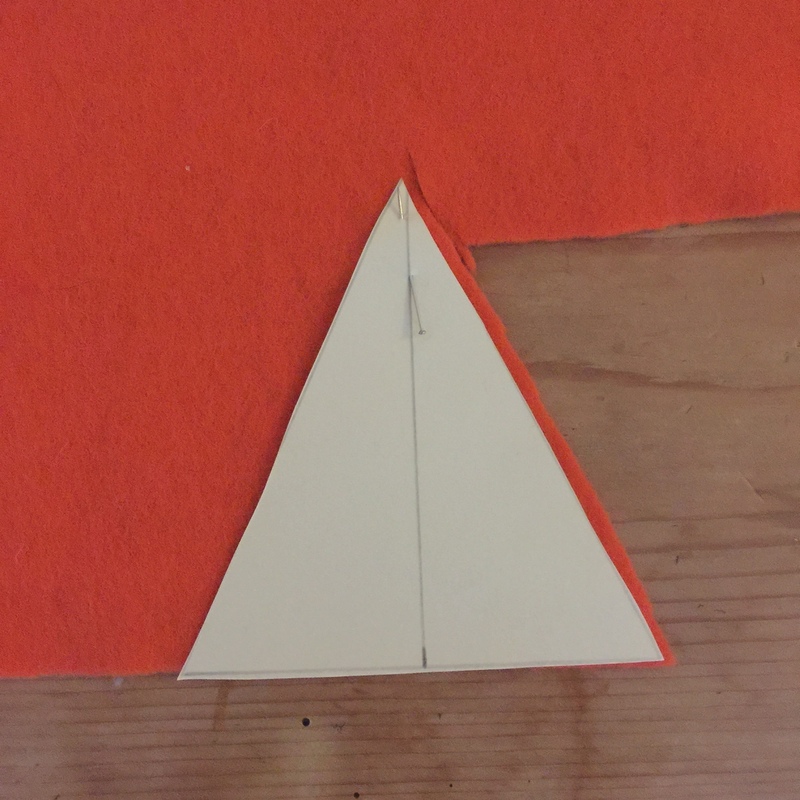 Now pin your triangle to your felt and cut around the bugger. Continue like this until you have 7 triangles. 4. Now fold your length of bias binding in half and press with iron. 5. 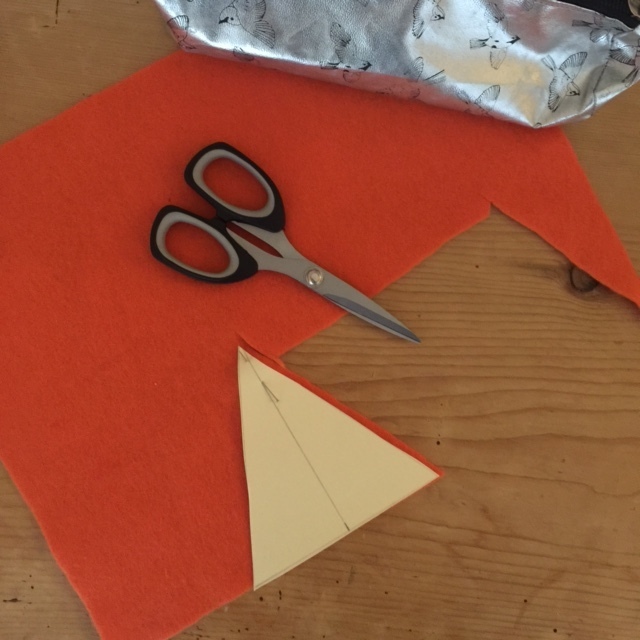 Next, tuck a felt triangle into the pressed binding, a few inches in, and pin it in place. Leave about an inch and pin your next one. And so on, until you’ve tucked in all your triangles (aw). 6. 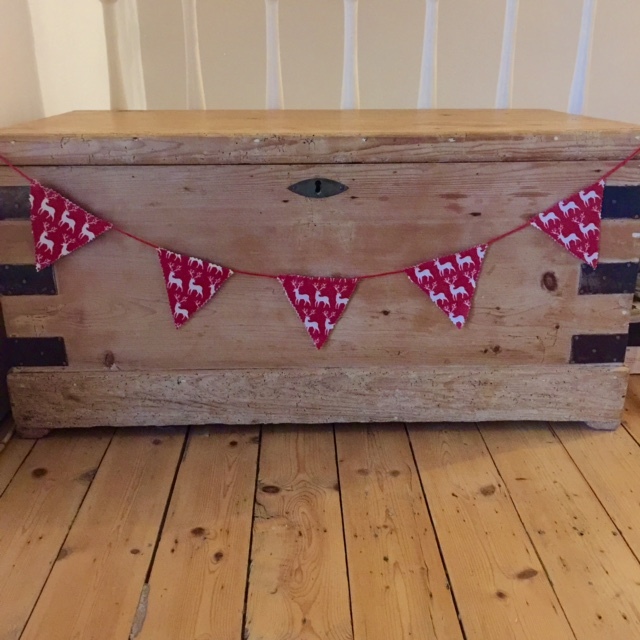 Now it’s time to unleash the needle and thread – and your primary school sewing skills – and start sewing that bad boy. Don’t worry too much if you’re crap. You can get away with a lot with white thread on white binding. OR, if you’re a whizz on a sewing machine then do it that way. 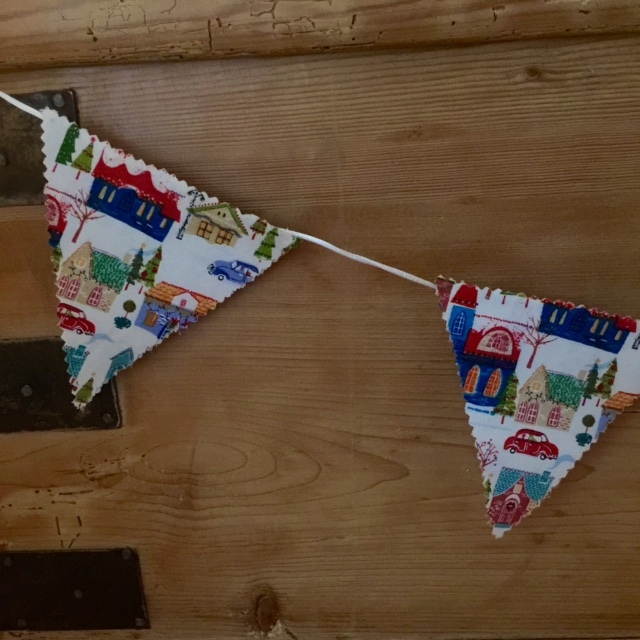 As a side note, obvz if you’re feeling confident you can get longer bias binding and more felt and turn your mini bunting into big bunting that you hang from your ceiling and your walls like in Bake Off. Or something cooler. Being little, we thought we’d start small. 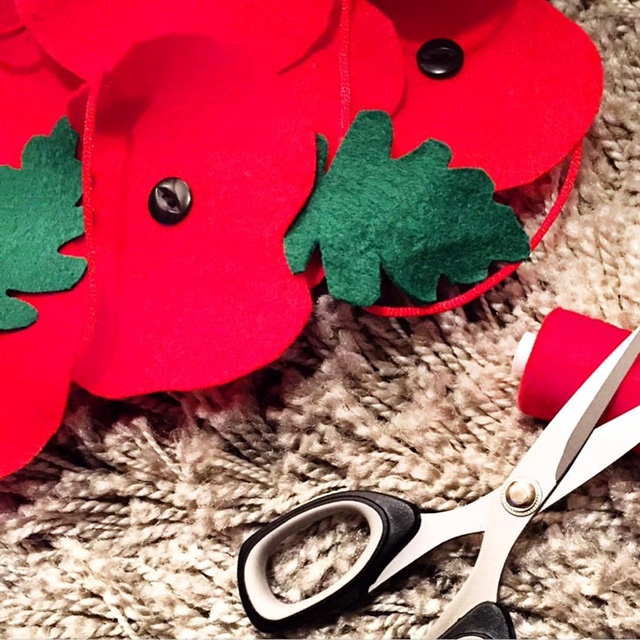 Are you a fan of crafting? 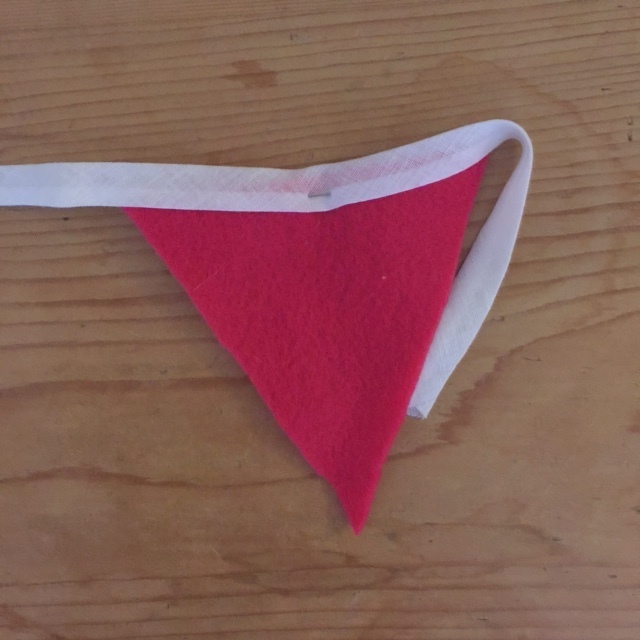 Bunting? We’d love to get your feedback/tips! 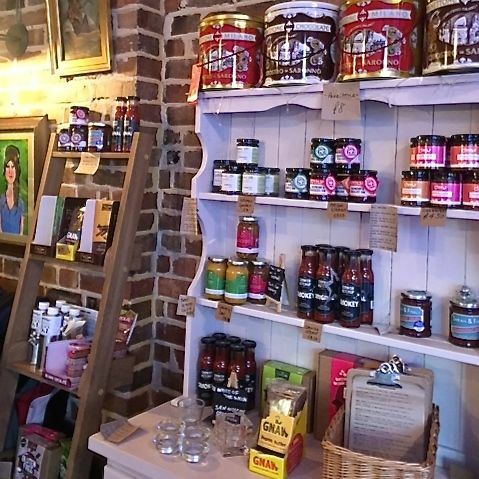 Ooh and feel free to visit our shop if you fancy – we have lots of nice craft-y things in there if you don’t feel like making things yourself.